for Regulation & Self Control. Abromitiella ( ay-bro-mite-ee-el-ah ) is a genus of prickly-leaved plants that grow in rocky outcrops. 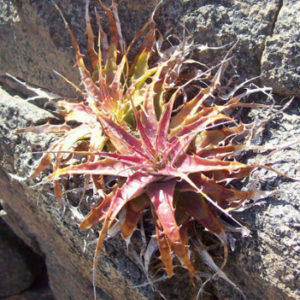 Many of the species multiply quite rapidly compared to other Bromeliads. Eventually they form low-growing colonies that follow the contour of the landscape and look just like flowing water. The genus was recently renamed Deuterochonia but we use the older name in our work. 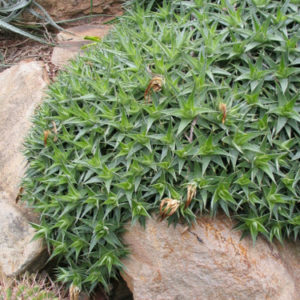 Abromitiella grow in Argentina, Paraguay and central South America. Botanical Archetype – MODERATION ( of Thought, Emotion, Action ), Regulation, Management. Root Issue – REPETITION, REPRODUCTION ( of the Original ). Wild imagination or ideas that you are unable to harness, act upon or bring to fruition. Systemic spread of toxic thoughts. Uncontrollable emotions, thoughts or behaviour. Primary Emotion / Emotional Symptom – WILD / OUT OF CONTROL. + Manage, Regulate, Harness, Bring Under Control, Abate, Self Control. – Wild, Out of Control, Rampant, Viral, Systemic, Contagious, Multiply, Spread, Overstimulated, Toxic. Lesson – The mind is a wild horse that needs to be harnessed to reality. Abromitiella help to bring things under control. Abromitiella ‘dry up’ excessive or toxic thoughts which spill over into the emotional realm and then cascade into the physical body. Abromitiella provide key lessons about cellular activity in the human body. This is the botanical symbol for genus Abromitiella. It is found in all of our books, clinical manuals, flower notes and charts.